2016 has been a busy year. My youngest son graduated from high school, my husband retired from the Air Force, family flew in for the big events, and we recently moved from Boston to Sacramento. By recently, I mean we drove into town on Sunday, and I’m writing this blog post from a hotel room. This is pretty much the only writing I’ve done since May, but now that we’re waiting to close on a house, I finally have time to get back to my book. (Yay!) 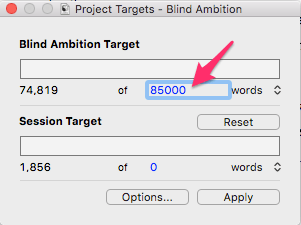 Which means new word count goals. 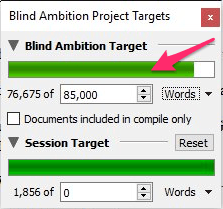 Luckily, Scrivener makes setting goals and tracking progress easy. No math required. 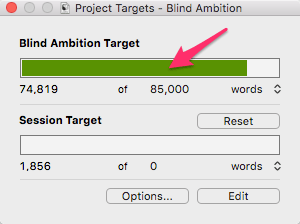 Whether you want to see your progress toward a word count target for a manuscript, a writing session, or a single document, Scrivener has you covered. 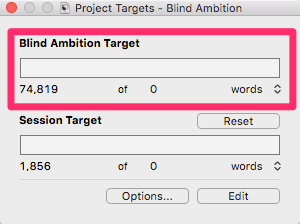 Here’s how to use Project Targets to set—and track progress toward—your manuscript word count goal. This applies only to text written in documents or folders within the Draft/Manuscript folder. Go to Project—>Show Project Targets (Mac) or Project—> Project Targets (Windows). The upper section displays a progress bar and word count for your manuscript. 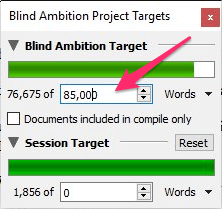 Click in the number box after the word “of” beneath the upper progress bar to enter a goal for the entire manuscript. Mac users click Apply. 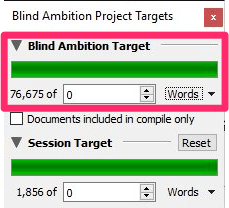 The progress bar fills with color (in graduated shades from red to green) as you add words. 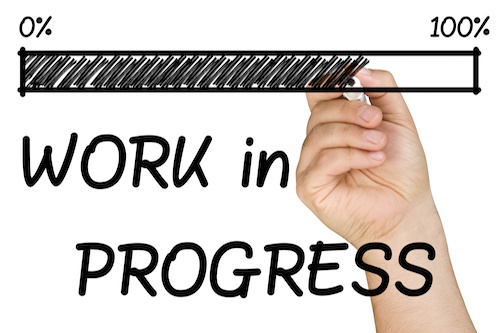 You can close the Project Targets window and open it periodically to check your status, or leave it open while you write. 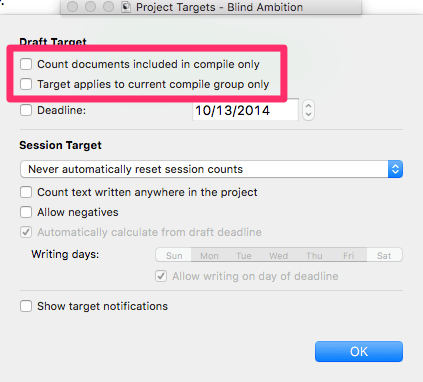 I also recommend you deselect “Target applies to current compile group only.” Turning these off will ensure Scrivener counts all text added/removed from any document within the Draft/Manuscript folder. 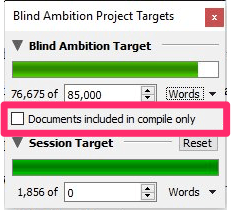 The Windows version counts everything written in documents or folders within the Draft/Manuscript folder by default, but if you’d like to limit the manuscript progress count only to items marked “Include in Compile” (either in the Compile window or in the Inspector), check the “Documents included in compile only” box in the Project Targets window.